Linda is credited with the movement to Consultative Selling, which is the cornerstone of Richardson’s methodology. Linda is the author of ten books on selling and sales management, including her most recent work; Perfect Selling, The Sales Success Handbook — 20 Lessons to Open and Close Sales Now, Sales Coaching — Making the Great Leap from Sales Manager to Sales Coach and Stop Telling – Start Selling. She teaches sales and management courses at the Wharton Graduate School at the University of Pennsylvania and the Wharton Executive Development Center. Many customers are satisfied with their vendors, however today vendors need to delight or surprise customers. They do this by going above and beyond the call of duty. 1920: Patterson introduced the concept of featured and benefits and scripts. Present: The buyers have changed because they have access to the internet. By time the buyer is introduced to the sales person, they have gone through a large portion of the sales process. The seller now needs to come prepared to add to what the buyers already know. The key is not abandon customization or consultative selling, the seller just needs to add to what they already know. The quality of the seller needs to improve because the buyers know more today. The sales person needs to become more educated on the client and industry. They will need to not only know about present needs, but also future needs. The seller will need to be way more prepared. This where all of your futuring comes in play and the seller brings insights that adds to what the buyer knows. This will also help you bring more information. Buyers want to learn how things are going to impact their organization and what the outcomes will be. Sellers must be able to provide this information to their buyers. The organization must have best in class sales practices. They must have phases with best practice activities. For example, these things must take place in order for the deal close. The seller must be able to provide an emotional connection with the buyer. Sellers sometime overlook this but you must be transparent and show volubility. Research about the client and their industry, blogs they read and social sites they go to. Learn how your clients thinks and then you can bring more value to them. “Changing the sales conversation” with Linda Richardson. Tired of your same old sales performance? Well, this episode is just for you. Linda Richard is the queen on consultative selling and in today’s episode we talk about how sales people must change the sales conversation in order to find success. You will love it, listen now! 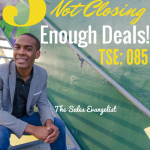 TSE 406: How Can I Sell In A More Consultative Manner?